I have tried not to falter; I have made missteps along the way. But I have discovered the secret that after climbing a great hill, one only finds that there are more hills to climb. I have taken a moment here to rest, to steal a view of the glorious vista that surrounds me, to look back on the distance I have come. Although it is hard for any of us to truly imagine what the life of Nelson Mandela must be like, I am certain that his ability to make decisions has much depth, balance and complexity. Many of these choices have been made at the expense of his own freedom and self-interest but were choices that were Nelson Mandela’s to make. Imagine that the tree below represents your life from birth at the very bottom, in the roots of the trunk to death at the very extreme ends of the outermost twigs. Consider that each step along the journey of life (or symbolically in this representation along the trunk, branches and twigs) represents continuous learning and decisions made at various stages of your life. Naturally, in the formative years the trunk is thicker, symbolising that the first 5-10 years of life are an incredible learning and development opportunity, influenced by family, school, friendship groups etc. As we get older and develop greater independence we begin to make more decisions on our own – i.e. move up the tree along the branch network. Which branch do we take? These choices are influenced by many factors such as situation, values, personality, ethics, morals and other inputs. Once decisions are made and progress continues through living life or metaphorically moving ‘up the tree’ we will never be back at that previous position again. A different decision takes us along a different pathway or branch, always moving higher, always developing with each step forward or change in direction reflecting a decision that you have made. By the time we get to the end of our journey i.e. the outer-most twigs and branches, we have made many decisions that have affected where precisely on the tree we have ended up. It doesn’t really matter whether you are on the left, far right or the middle section of the tree by journey’s end. We all start at the same point at birth, however ultimately, your final position is dictated by the decisions you make along the way. 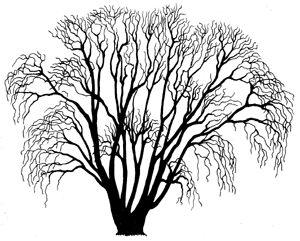 The tree has many distinct and potentially varied pathways, fulfilling a meaningful and sustained life, yet share few commonalities between pathways apart from the initial starting point. There are few rights and wrongs but many opportunities exist to forge your own direction. If you know it was genuinely made with all the right intentions? It was made through seeking the most detail and information available at the time? If you had your own and others best interests in mind? As years pass, you won’t remember the finer details regarding the decision-making process but if this is a consistent philosophy that you adopt you are more likely to remain comfortable with your decisions and the direction(s) you have taken. Regrets are all too often the result of a lack of information, confidence and transparency in our own abilities to clearly make these decisions in the moment. Clarity of purpose, removing decision bias/prejudice and developing a high degree of self-awareness will lead to fewer genuine regrets. Whilst you ponder your own choices also consider the choices made by others. Use these examples to compare journeys and check whether where you find yourself right now is by deliberate design, luck or good planning. I often consider my pathway and influence on my own direction however I wonder how someone like Mandela feels about his life choices. Although you may feel that your own life and subsequent choices have less global impact and recognition than those of someone like Mandela, never underestimate the effect of your choices on yourself or those around you – choices always matter and always have an impact! I have learned that success is to be measured not so much by the position that one has reached in life as by the obstacles overcome while trying to succeed.